Choosing to use managed services isn't strictly an IT decision. There are a number of business benefits that manifest themselves to managed services users. These benefits have an ongoing effect on the business process and should be as carefully considered as any technology issue when choosing to implement managed services in your environment. 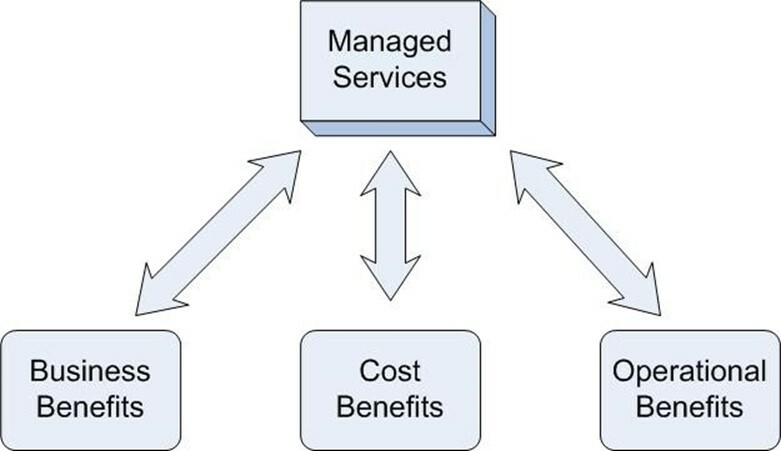 Figure 1: Managed services offer a combination of benefits to the average company. Are there IT services that are needed that aren't currently being provided? Is there an advantage to providing a common set of services to a geographically distributed group of users that would not be cost effective to provide with internal resources? Are there Managed Service Provider (MSP)‐offered services and applications that can improve the bottom line? These are the types of questions that need to be asked internally to determine whether there is a business need for utilizing the offering s of an MSP. Let's look at some of the key issues in making the business decision to implement managed services. One of the most difficult business decisions for SMB‐sized businesses is how much to invest in IT infrastructure, both hardware and applications. Although the IT requirements for business today are clear cut, the need to invest in resources that can grow with the business and can match the rate of business growth often requires more art than science. Estimating the growth rate of the business and pre‐buying equipment and software that allows the expected growth is one of the most difficult tasks in IT operations and budgeting. Guessing wrong can waste funds or, at worst, prevent the business from meeting its goals. Flexibility is one of the areas in which managed services excel. The MSP can offer the ability to add anything from complete classes of additional services to the simple additional of seat licenses for a specific application. These services are added when needed, and while the business still needs to budget for these services, there is no need to invest in the IT infrastructure to specifically support these future changes. This benefit takes the form of either reduced spending in IT, so that money can be saved on hardware or in hiring specific areas of expertise, or more effectively, in more targeted IT spending, so that IT spending can be more closely aligned with responding to business needs rather than back‐end expenses. Thus, business challenges aren't limited by what internal IT can deliver right now but by what services can be added and supported using the combination of internal IT resources and managed service providers. Risk management with IT services is a combination of services and support issues matched with the need to continue delivering business services to the users. Every business process and its related IT applications should have a plan in place to continue operation in the face of problems, be it a minor glitch or an absolute disaster. Limiting the potential for problems in the IT environment is an ongoing task for IT. Limiting potential failure points is a basic rule of thumb in preventing IT operational problems from impacting business processes. Using an MSP to provide business services means that the potential points of failure that internal IT needs to deal with are limited to tasks that they would already be performing: keeping systems running (client and/or server, depending on the MSP‐provided services), making sure that the internal network is operating properly, and ensuring that the connection to the Internet is maintained for users. Keeping the managed service available is the responsibility of the MSP, and your level of service will often be determined by the contract with the provider. Thus, your internal IT can focus on keeping their piece of the puzzle functional, which in almost all cases doesn't require stepping beyond their normal day‐to‐day IT tasks. So without additional investment in IT infrastructure, moving line‐of‐business services to an MSP can result in a more secure and lower‐risk business computing environment. Effective IT spending can result in improved profitability overall. This is a fact that is often overlooked when considering an MSP. Traditional IT spending involves significant capital expenditures: the equipment necessary to make IT services available has to be planned and budgeted for. Ongoing administrative and maintenance expenses continue to be factored in for the life of the hardware, while software requires maintenance contracts and IT services to keep updated and securely patched. With managed services, the money spent on services is spent directly on providing the actual services. There is no additional budgeting on collateral support expenses beyond that which would normally be spent on the management and maintenance of systems in your computing environment. Business is able to directly correlate the expense with the service being supplied; the money being budgeted for the managed service is basically the entire expense that needs to be considered for the service, allowing IT dollars to be spent very effectively. Ongoing operational tasks and costs are reduced with the use of managed services as the internal IT requirements for support of those services is minimal. This allows IT to focus on operational issues concerning only those services supported internally and focus their attention on line‐of‐business processes that make the company money. Compare the costs of these items to the per mailbox expense that an MSP will charge to provide full‐blown Exchange Services to your business as a service. Not only are the initial expenses lower, the ongoing expenses will likely be no more, and in many cases less than, maintaining your own Exchange Server internally. And as you expand your environment or user base, there is no danger that you will outgrow your investment in software and hardware. A full‐service MSP will likely also offer additional services, such as SharePoint integration, to allow you to further expand your business capabilities with no upfront costs for new hardware or expertise. Using managed services can result in improved customer relationships—the more agile and responsive IT, the better the experience of the business customers. There is nothing more detrimental to ongoing customer relations than the inability of a business to respond to customer needs and demands. No customer wants to hear that there is an unavailable service that is preventing them from getting an answer to their question, a product shipped, or a service delivered. By utilizing managed services to handle a portion of your IT tasks, a business is able to focus more attention on their customers and other front‐end activities utilizing resources that would otherwise be spent on back‐end operations. From the perspective of the business model, managed services offer a cost‐effective way to add services to the IT offerings that the business can utilize. It prevents the need for upfront spending for the managed tasks and allows for the adoption of new technologies with minimal expense and in a risk‐adverse fashion. Added flexibility to the IT services available without revamping the IT infrastructure is an attractive option to the business decision maker. This can make IT spending a more palatable option in times of tight spending and minimal budget increases.